The United Mine Workers of America (UMWA) announced today that it has reached collective bargaining agreements with Alpha Natural Resources covering five Central Appalachia coal preparation plants which had previously been owned by Massey Energy. Workers at the plants had been working under the provisions of a previous contract that expired in 1998. 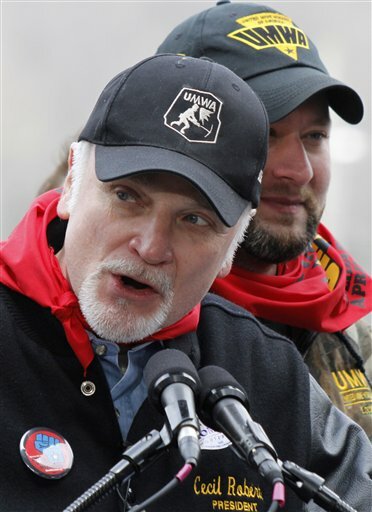 “This is a very good day for these workers and their families,” UMWA International President Cecil E. Roberts said. “They will get a substantial initial raise, the first they’ve had since 1998. They will get annual wage increases for the life of the agreement. They will get a $1,000 bonus. They will get shift differentials, a clothing allowance, sickness and accident benefits and the best quality health care benefits. “I commend the workers at these plants for persevering so long and sticking with the UMWA in the face of constant attacks by the previous ownership,” Roberts said. “Massey simply refused to take any steps to reach a fair agreement as long as these workers stayed in the UMWA. But the workers stayed united and it ultimately paid off for them. The agreement covers some 145 workers at the following locations: the Bandmill preparation plant in Logan County, W. Va.; the Long Fork preparation plant in Pike County, Ky.; the Goals preparation plant in Raleigh County, W. Va.; the Chesterfield preparation plant operated by Alpha subsidiary Omar Coal Co. in Boone County, W. Va.; and the Power Mountain preparation plant in Nicholas County, W. Va. The 5-1/2-year agreement goes into effect Jan. 1, 2012, and will continue until June 30, 2017. Thanks to UMWA Pres. Cecil E. Roberts for leading the way for our brothers and sisters represented at those operations that have outlasted the evilness that Massey represented. We hope and pray for the other miners that have not joined the UMWA, that after the death and terror they endured has gave way to a new prosperous future with all of the companies that have reached agreements with our organization. A Merry and Prosperous Christmas to all of those who toil in the mines, and God Bless our President and all of his Staff who helped win this victory, for our members and for Alpha. Sincere congratulations to UMWA and to all of the workers at these plants who stood together for their rights and those of their fellow workers. We may not agree about some issues frequently covered on this blog, but when it comes to protecting the safety of miners and their right to collective bargaining, there’s not an inch of daylight between us. Merry Christmas to you and your families, and let’s hope this is just the beginning of a larger trend in the industry. While impreved health, safety, and benefits of miners is a good thing, my concern is that Mr. Roberts will become even more defensive of the industry at large now that he has such a cozy relationship with one of the companies committing the most mountaintop removal. He’s lobbied against EPA actions to compel more law-abiding behavior by the companies; is the UMWA-Alpha alliance becoming even more solid? Thanks, Matt. Merry Christmas to you, too. Vernon, please tell me where in the above release from the UMWA it says President Roberts has a “cozy” relationship with Alpha? Working together to improve miners’ safety, health and benefits can be a mutually beneficial thing for both labor and management, and what’s wrong with recognizing it when a company does the right thing for a change? Doesn’t make us cozy. As along as Alpha and other companies keep their “union-free” posters up at their non-union mines, ain’t nobody getting cozy. 4th paragraph above, Roberts’ language sounds plenty cozy to me. These “right things” don’t begin to compensate for the big wrong thing, MTR, that Alpha is still committing against the people. And when it comes to MTR, Roberts’ UMWA has “not an inch of daylight” between it and Al-pha.